Water repellence results in uneven wetting of soil in autumn which can result in patchy and staggered crop and pasture emergence. Sandy soils are particularly susceptible. Soil water repellence can cause yield reductions that are worse in dry seasons and less in wetter seasons. Assessing plant establishment and soil wetting patterns after rain can be used to diagnose soil water repellence. Soil water repellence is usually one of the easiest soil constraints to diagnose because of the obvious impacts on crop and pasture establishment. There can be a number of reasons for poor crop establishment and it is still necessary to confirm that water repellence is the main cause of poor plant emergence. Water enters into repellent soils unevenly along preferred pathways that may be a result of micro-relief (shallow hollows or furrows), variation in severity of repellence or biological-induced pathways including remnant root systems and biopores. Persistent dry soil patches occur in areas where water doesn't enter, the size and persistence of these dry patches is related to the severity of the repellence. Poor infiltration of water into dry topsoils. Expression of water repellence symptoms in crops and pastures can vary with the frequency, intensity and size of rainfall events and the soil moisture conditions at seeding. The more severe the water repellence the more consistent is its expression across a range of wet and dry seasons. Dry sowing will tend result in poorer crop establishment on wate repellent soils as will the use of knife points for furrow sowing. Generally soil water repellence can be demonstrated by placing a drop of water on a dry soil surface that is either flat or a shallow hollow. If a soil is repellent the droplet will form a bead (Figure 1) and not soak into the soil quickly but can remain sitting on top of the soil surface for a long time. Eventually the water droplets do infiltrate into the soil and the longer that it takes for this to happen the more severe the water repellence. Heating of the surface 5-10mm of soil by the sun can volatalise the waxes that cause repellence and water placed on the surface will appear to soak in. However if the top 5-10mm is scraped away and water placed on the soil underneath it can often be highly repellent. Prescence of remnant root systems or biopores that may act as preferred pathways for water to enter. Field testing can still be undertaken but several observations should be made to take into account the above variables. Direct observations of water entry and occurrence of dry soil following significant rainfall or after watering a patch of soil with a watering can or relatively gentle spray from a firefighter can be very helpful. These observations are only a visual indication of water repellence but are helpful because they are the best way of determining the expression of the constraint in the field. It can be possible to assess what proportion of the soil has been made wet by a given rainfall or watering event. The water repellence of collected soil samples can be determined away from the paddock. Samples of topsoil are generally collected from 0-5cm or 0-10cm. If these are not dry then they can be left to air dry or dried under warm conditions of about 40°C. Large fragments of organic matter are removed by passing the dry soil through a sieve or colander, typically with holes 2mm in diameter. Small water droplets can then be placed on areas of flat, dry soil and the time it takes them to enter the soil can be measured. If the droplet takes less than 10 seconds to enter the soil it is considered not repellent. If it takes 10-60 seconds it is mildly repellent, 60-240 seconds moderately repellent and more than 240 second, severely repellent. Often crops have poor vigour which is probably associated with reduced access to nutrients in dry repellent soil. Patchy emergence early in the autumn typifies pastures on water repellent soils. 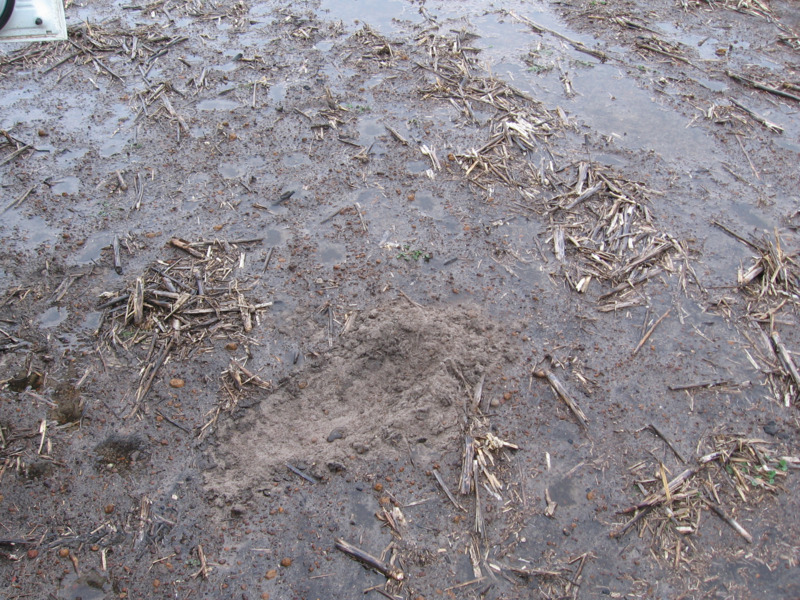 Light rains accumulate in hollows and hoof prints and wet the soil sufficiently for plants to germinate in patches. The pasture has patches of plants on wetted areas with dry, bare ground in between. Subterranean clover is at a competitive disadvantage to aerial seeding plants. Its runners do not preferentially place the seeds in the hollows, and seeds placed just below the soil surface of repellent soils may not be wet by light rains. When they do germinate, the roots may find only dry soil underneath the seed, so the seedling dies. This can lead to a decline in the productivity of clover pastures. On repellent soils the pasture contains younger and older plants, which results in difficulties with some herbicides, which are best applied at specific growth stages. Insects (for example, redlegged earth mite) can be particularly damaging as they are able to multiply quickly on early established plants and severely damage small later emerging seedlings. Soil water repellence research is supported by DPIRD and Grains Research and Development Corporation through DAW00244 Delivering enhanced agronomic strategies for improved crop performance on water repellent soils in Western Australia.